Tea’s essential benefit is as a soothing and calming lifestyle. 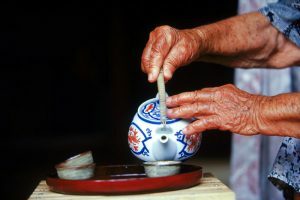 From the sound of boiling water, to the patience of waiting for the water to boil, to the contemplation of steam rising, to the slow steeping of the leaves, to the savoring of the perfect up of warm flavorful liquid – tea creates an alternative reality form our fast-paced, stressful, hectic everyday world. Tea is a natural and healthy drink. Each type of type exhibits slightly different health benefits. But, generally speaking tea is rich in anti-oxidants, vital minerals and many vitamins. Some types are known to aid weight loss, others to support heart health. The internet has a wealth of knowledge about the health benefits of tea. In addition to all of the health benefits of drinking tea, the most important may be its mental, emotional and spiritual benefits. I believe that the tea is the perfect aid for a world filled with interesting and informative conversation steeped with Civility. Preparing or enjoying a cup of tea gives permission to turn off the phone and be totally present with yourself or a friend. This time honored tradition is somewhat unique in today’s world, which makes the ritual even more special. Many scientists and respected authors have also noted the health benefits of tea. In this article on WebMD.com , Louise Chang, MD, speaks about the types of teas and their various attributes. The Moment: use a special cup, put on some pleasing music, turn off the outside world then sit and enjoy this very moment…create a mini-oasis moment right where you are. Invite your friends, colleagues or clients: the ritual of afternoon or high tea is centuries old. Use this opportunity to network for business, talk about what’s important to you or simply to enjoy the presence of those you know and love. Practice the art of civility – the natural tone any time you drink tea. Tea is served, which is one of the reason why it’s such a special ritual. When we serve others, we are truly connecting with our innate nature. Allow yourself to focus on this way of serving and feel the goodness it brings.